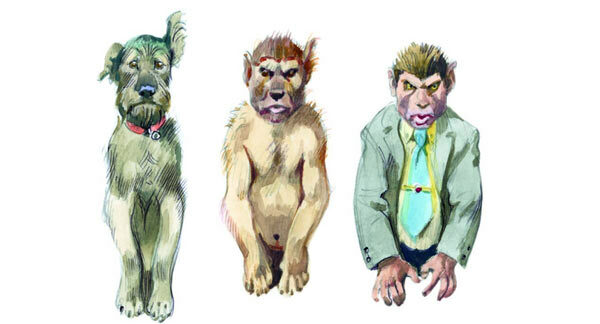 From Non-Human Resources: are dogs white supremacists? Obama Saves Earth From Apocalypse: What's Next? Psychopathy checklist: have you seen this man? I move to the groove of the People's Director! 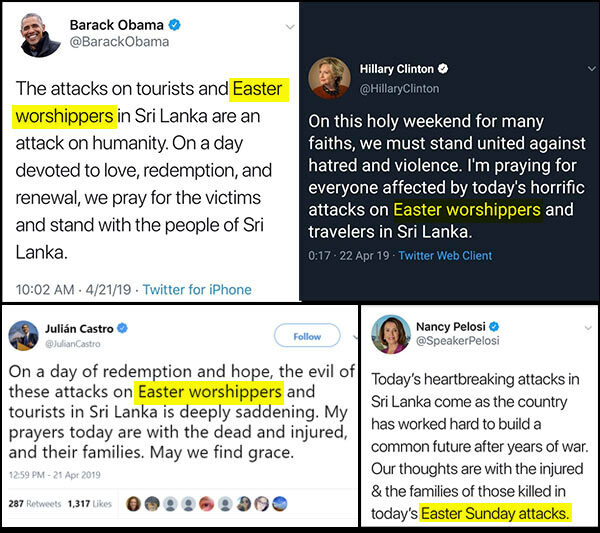 Some people did something in Sri Lanka, and then some people tweeted something about some 'Easter worshippers' who died there. And since no one had heard of 'Easter worshippers' before, no one cared. The DNC has apparently sent out a memo to make sure all tweets conform to the "gravitas-type" standard of unanimity. 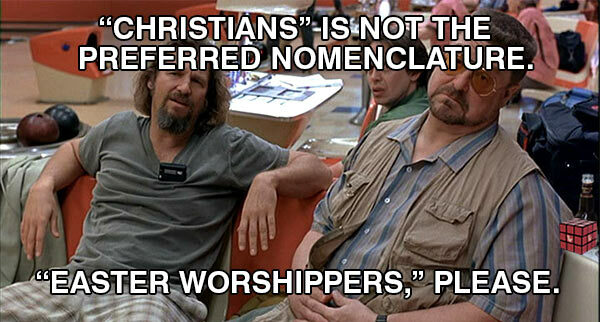 Yes, 'Easter Worshipper' Was Intentional. Yes, It Matters. Here's Why. A source inside the DNC has told us how the new term was coined. This is a reenactment. No word on whether the Ramadan worshippers will be showing solidarity by wearing bunny-eared hats to the burials of painted Easter eggs. It is unfortunate that the hooligans known as Social Justice Warriors have jumped the rails by branding dogs as "White Supremacists." It seems that in their headlong, empty headed rush to hang the White Supremacy label on everything and anything, SJWs have expanded their perverse notion of inclusivity to animals. If the SJWs can stoop this low in their effort to blame all social ills on White, Western, European, etc. people and institutions, they reveal that their absurd animus does not brake for animals, therefore they must be condemned for detaching themselves from reason and launching themselves into the boundless realm of the preposterous. Fortunately, The People's Cube is dedicated to equality—especially equality of results—but also social equality in the form of extreme diversity and inclusion practices that are far, far ahead of our less than equal peers in the corporate and academic world. The People's Cube Non-Human Resources Department is a shining example of how far we will go to ensure maximum diversity, maximum inclusion, and maximum maxima that offends no one while not offending anyone, resulting in a most equal equality. A Twitter post video of a person purporting to be Alexandria Ocasio-Cortez has been circulating on the internet. Many have believed this to be genuine. In actuality it is not genuine. As a public service, The People's Cube researched the facts. Allegation: The person in the Twitter video post is Rep. Alexandria Ocasio-Cortez. Fact: Though the person in the video purports to be Alexandria Ocasio-Cortez, the person in this video is not Alexandria Ocasio-Cortez. Allegation: Twenty-nine plus twelve equals thirty-seven. Fact: In discussion with the real Alexandria Ocasio-Cortez she utilized her toes as well as her fingers and did properly solve this math problem. Allegation: Venezuela is a Socialist country. Fact: Venezuela is not now nor has it ever been a Socialist country. Venezuela is a failed Capitalist country. Allegation: Many of Alexandria Ocasio-Cortez's friends have emigrated from Facebook to America. Fact: The opposite is the actual truth. They've emigrated from America to Facebook. I keep getting references in the people's propaganda newscasts that refer to "code and dog whistle" spoken by those more equal than I. Where can I obtain such a book as this that I may be fully informed? 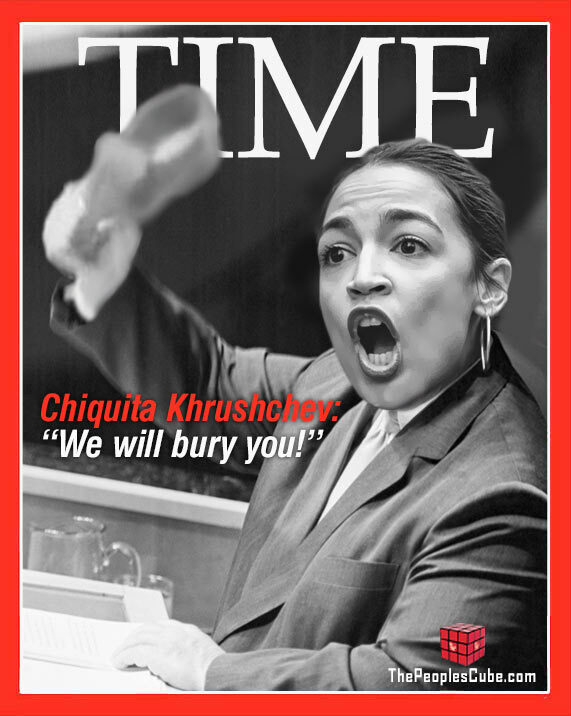 And you thought Ocasio-Cortez was being hyperbolical when she compared the struggle with climate change to World War Two! Watch this latest video by Ocasio-Cortez and you'll see how she plans to turn society into an army whose mission is to conquer territory and create living-room for the Planet. The video shows how this will be accomplished. Work is going to become tearing down civilization so as to make living-room for the Planet. Where are these places shown in the video being turned back to wilderness? These places can only be where humanity is right now; our towns, our cities, our civilization. She also proposes a new timeline for the Life of Julia. Komrades, the voters have spoken and they chose real people to pass real legislation that helps real communities. 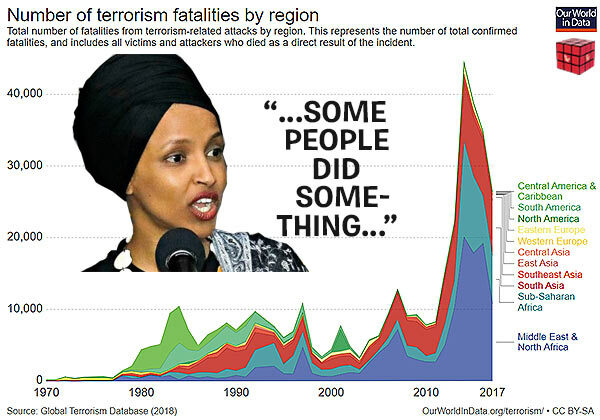 Those who doubt the organic nature, the pure authenticity, of the Tlaib-Omar-AOC trinity be damned into eternity, god willing. Pelosi (D-CA) gave a speech Monday at the London School of Economics, in which she said the Democratic Party has got to avoid the “menace” of far-left policies that are often advocated by young and rising political stars, like free healthcare, free college tuition and a higher minimum wage. She said the Democratic socialist — who’s pushing the Green New Deal environmental plan with a $93 trillion price tag — and others like her represent only a tiny faction in the margins of American politics. Mexico City -- In a surprising twist, the Mexican legislature resigned today and decided to replace itself with the Democratic National Committee of the United States. The Office of El Presidente issued a statement claiming that California Governor Gavin Newsom has been appointed as the official successor to the Office of President, and Colorado Governor Polis as Vice President. “It is just the right thing to do. The American Democrats are working harder for the Mexican people than we ever did,” the Mexican President's statement said. I just reviewed a movie I had never seen before and posted a review of it on Roger Ebert.com. The movie is: Desert Dancer, a story based upon a true one. It was wonderful! ENIGMAGIRL • It’s 4/11/19 and I just caught this movie a few hours ago. I loved it and could not take my eyes off the actors and their sincere and passionate love of life. Many of my Iranian friends who fled Iran display this same quality. To me, Desert Dancer is a metaphor for the desire for freedom we all have: The freedom of expression danced in the middle of a desert says much, including the enormous effort it must have taken to actually dance in sand. The lovely leading lady’s audition truly touched me. I, who have studied dance, wished I could have expressed as eloquently as she did, what I truly felt. Many feel that dance is just a bunch of bodies flopping their arms and legs about. Not true. It takes inner resolve to express oneself so openly. The choreography was awesome! The lead character, after having been through so much, does the very same while in Paris. It’s as if she, the leading lady, transferred her “torch” to him. It’s about freedom, not dance. And, the dancing is quite good! I had tears streaming down my face at the end. I give it as many stars as it can get! She's sweet, warm, and fuzzy! Won't you take her home? Sweet Miss Nuke. The new Miss Tactile Nuke doll is dying for you to buy her from your local TPC Dry Goods store and take her home. She will love you to death. While you're at it you may want to buy a Trotsky Kulak Monster doll too. The Kulak Monster is her brother and you probably don't want to separate the family. That's what Trump does! 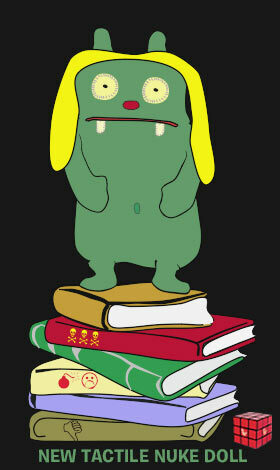 So you'll want to buy the Mommy and Daddy Kulak Monsters as well. And while you're at it it is advisable to purchase all extended family Kulak Monsters. If you know what's good for you. Don't delay! The warm and fuzzy Tactile Nuke doll is getting impatient just sitting there on the shelf in the Dry Goods store. Take her home and enjoy the warm tactile fuzziness of Miss Nuke. You better. Don't make her blow her top. The People’s Representative, Rep. Eric Swalwell has announced his candidacy for the 2020 Presidential Campaign. Full achievement of years of The People’s agitation through the constitutional phrase: “separation of church and state” to ensure that government does the exact opposite of any man-spreading advice, nay even commands of that non-existent entity formerly known as God. Yes, comrades, the glorious world of Next Tuesday is scheduled to arrive in the 2020 Election Cycle. The State Church of the Sacred Heart of No Redeemer wholly endorses the Swalwell Campaign Slogan: “Go Big. Be Bold. Do Good.” No other candidate so exemplifies the folly of that out-moded 18th Century opiate of the masses form of religion than The People’s Candidate, Eric Swalwell. Tell this man, he can’t do something...and he will prove everyone..even that deposed Deity.. wrong. Only in service for The People can a man even dream of paying off a Student Loan Debt of $100k. Clearly, Swalwell embodies the kind fiscal decision making skills necessary to not only attain the glories of Next Tuesday, but to make the following Wednesday a never-ending reality. Go Big. Be Bold. Do Good. - The State Church of the Sacred Heart of No Redeemer advises all parishioners to contribute https://ericswalwell.com/. I'm confused of late. Just when I thought that we were going to be celebrating the party here in the United State, it seems Islam wants a piece too. I kant say it's all that different, so maybe I shouldn't be worried, but I did find this CommunIslamic promotional piece that I wanted to share with you. It seems both groups are united in hate. One of the best condemnations of socialism in art, A Dog's Heart is a dark comedy and a must-watch post-Soviet classic. It is an adaptation of a story by Mikhail Bulgakov, who is mostly known in the U.S. for his Master and Margarita. Originally written in 1925 as a stream of consciousness of a stray dog in Moscow, A Dog's Heart was banned in the USSR until the Perestroyka in the 1980s. Sepia-toned to capture the feel of time, it was made for TV in 1988. Here it is with English subs - make sure you click the CC option, or it won't show. We cannot expect the Americans to jump from capitalism to communism, but we can assist their elected leaders in giving Americans small doses of socialism, until they suddenly awake to find they have communism. Ocasio-Cortez represents one vision of the Democratic Party’s future. She’s a young Hispanic woman, three cornerstones of the party’s electoral coalition. She’s a democratic socialist at a time when confidence in capitalism is declining, especially among progressive millennials. The issues she ran on—a Green New Deal, Medicare for All, a federal jobs guarantee, abolishing ICE—are animating a new generation of Democrats. She’s a political phenomenon: part activist, part legislator, arguably the best storyteller in the party since Barack Obama and perhaps the only Democrat right now with the star power to challenge President Donald Trump’s. House Majority Leader and America's Sweetheart Nancy Pelosi today condemned President Donald Trump for his lack of fiscal responsibility during the Mueller Investigation. Speaking to a group of Democratic backers in a strip-mall parking lot, the Speaker lashed out against the spendthrift President's failure to fire Special Investigator Robert Mueller in the first three months of the investigation. 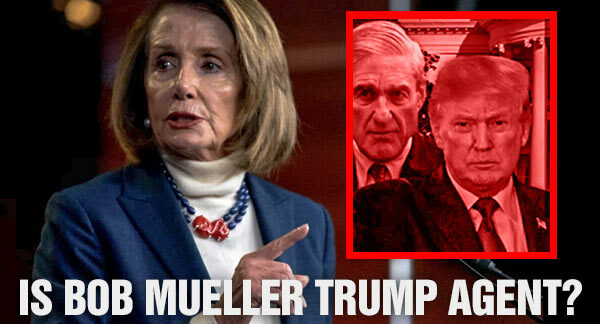 "Mueller spent over twenty-five million taxpayer dollars on an investigation that the President knew to be based on false accusations, yet the President did not use his executive authority to put a stop to this wasteful spending," said Pelosi. "He simply sat back and let the Special Investigator plow through a mound of money knowing full well that the investigation would produce no evidence of his wrongdoing whatsoever." The Speaker pointed out that as the chief of the Executive Branch, the President has the authority to fire personnel in the Justice Department, and that Mueller was an obvious waste of time and effort which Trump should have terminated. She further leveled the charge that the President had done so for partisan political reasons. "The President knew full well that the Democratic Party was deeply invested in the Mueller Investigation, anticipating a political bombshell at any moment that would allow us to finally and fully discredit the results of the 2016 election," the Speaker reminded her audience. She was outraged that the President allowed the Mueller investigation to continue, as it ultimately blew up in the DNC's face. "Mr. Trump has weaponized the Department of Justice to use against his political enemies," she declared, "He knew that Mueller's failure to find any evidence of collusion would reflect badly on the Democrats, the Never-Trumpers, and the News Media. He made the conscious decision to waste taxpayer dollars on an investigation he knew would fail, just to embarrass the opposition party." In her closing comments, Speaker Pelosi hinted that Congress is considering the appointment of a new Special Investigator to examine allegations from an anonymous source known only by the code name "PNG" that Robert Mueller received kickbacks from White House staffers to continue the investigation and thus further damage the Democratic Party image. 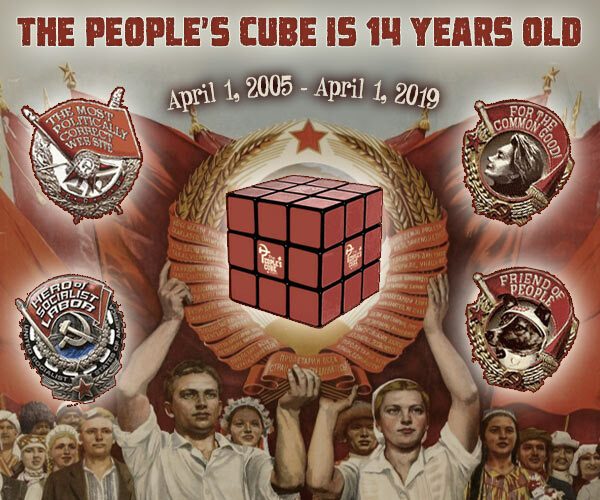 Glorious anniversary: The People's Cube is 14 years old! April 1st in our kollektive is always the day of remembrance and celebration. We honor the unparalleled achievements of our Party organ throughout its heroic existence, and we celebrate all our glorious successes of the past year. Despite the ever growing gap between the media and the people, despite the tough competition from such friendly Party organs as CNN, MSNBC, The New York Times, and The Washington Post, we have prevailed and kept our annual title of the Most Politically Correct Website. The main Current Truth of the past year was the Trump-Motherland Kollusion. Ending with the Mueller report, all the goals of our Five Year Kollusion Plan have been achieved ahead of schedule: pit Amerikans against each other, demoralize the nation, and portray its leaders as disturbingly vile degenerates. The Kremlin comrades who wrote the Steele Dossier have received government medals and are currently rolling on the floor laughing. On this side of the Atlantic the award goes to the Democratic Party and the Amerikan media, who selflessly toiled to meet the Kollusion Plan quotas, writing news stories and delivering the Current Truth to the masses at the cost of their own reputations. An adequate replacement for their lost reputations will be For the Common Good medal, awarded at a secret private ceremony by Our Many-Titted Empress. But what they didn't write is just as important. A special mention goes to the never-asked questions: Who were Steele's Russian sources and what happened to them? Where they punished or promoted to better positions? Why should they be trusted over American citizens? Who were the peeing prostitutes and what happened to them? Were they even real? If so, were they punished or promoted to better positions? And what positions would that be? In conclusion, we call on all Amerikan workers, peasants, and toiling intelligentsia to keep working tirelessly on advancing the Glorious Progressive World of Next Tuesday. 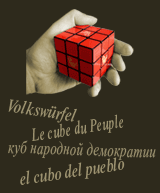 Spare no effort in reading the People's Cube, for the articles. And lastly, we'd like to start a tradition of choosing the best story of the past year. Let's broaden and strengthen our democracy by voting for the list below, or writing in your own candidates in the comments. Remember - your vote counts! And don't fear - there's a large contingent of superdelegates waiting in the shadows to korrekt your unwise choices. 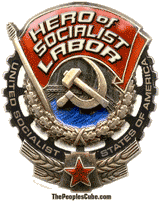 Either way, the winner will receive the Hero of Socialist Labor medal. 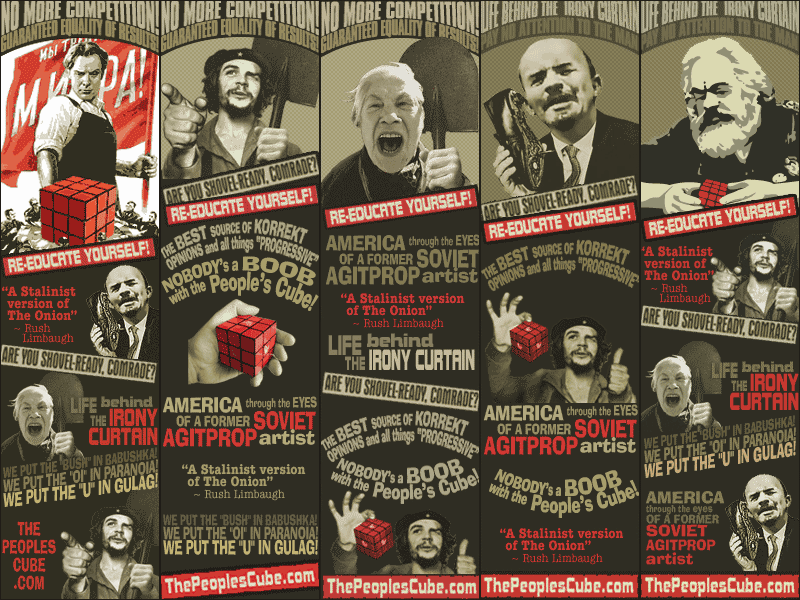 Long live the People's Cube, the unbeatable champion of progress and socialism! Party at 21:00 hours behind Tractor Barn #2. Vodka rations to each according to his ability. Bring your own beets. PROGULOGIES - The Hot New Party Game! Comrades! Find your missing ballots!